Martial arts are the fighting arts. Each martial arts style is a system of exercises, practices, forms and traditions combined into a training program to teach combative fighting and defense. Martial arts originated in the ancient cultures of Asia, including India, China and Japan. Martial arts are used to teach self-defense and to improve overall fitness, confidence and self-esteem. Some practitioners of martial arts claim they can also be used as spiritual practices. Karate is a generic term for Japanese martial arts. Japanese marital arts are heavily influenced by Zen Buddhism and the Samurai warrior tradition. Karate translates into "empty hand" in English and uses kicks and punches delivered with special shouts -- it is a defensive martial art. Judo is based on jujitsu. Judo means "the gentle way" and is concerned with both attack and defense. It is similar to wrestling and uses balance and leverage for its powerful throws. Jujitsu is self-defense without weapons and was developed in China and Japan. The movements use holds, joint locks, chokes and blows. Jujitsu uses the opponent's force of attack as a weapon against him. Aikido is another Japanese martial arts, and similar to jujitsu, it focuses on using the attacker's force against him. It emphasizes motion and the dynamics of movement. Aikido began gaining popularity in 1954. Kendo, also a popular Japanese martial arts, is a style of sword fighting that uses bamboo swords. The bamboo sword is approximately 4 feet in length. Fighters wear protective gear around the head, wrists and abdomen. Kung fu has many different systems and is a powerful form of martial arts that uses strength, low stances and powerful blocks. The original Shaolin kempo kung fu style is based on the fighting techniques of five animals. It is more than 5,000 years old and is practiced by Shaolin monks in China. Tae kwon do is the most practiced martial arts. It is a form of Korean fighting that is similar to Japanese karate. It is also an Olympic sport besides being a form of self-defense. In Korea, it is way of life and an artistic discipline, according to the World Tae Kwon Do Federation. The movements are graceful and powerful. 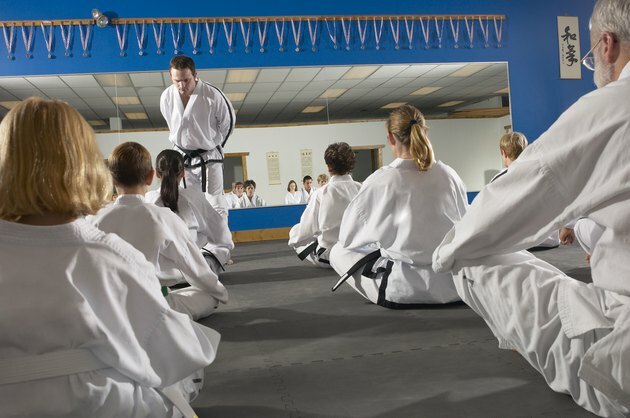 Tae kwon do develops posture, coordination, graceful movement and physical fitness. Tai chi chuan is a method of self-defense and an exercise that is practiced around the world for its health benefits. It is practiced by people of all ages and requires no special equipment. The movements are flowing and graceful and promote inner peace and tranquility. Kickboxing started in the United States in the 1970s and is a combination of karate and boxing. Fighters use their legs for kicks and their arms for boxing punches. They wear protective gear during sparing. Krav maga was developed in Israel and is the official self-defense system of the Israeli Defense Forces. Krav maga uses simple techniques involving instinctive movements. It is easy to learn and can be used by people of all ages. World Taekwondo Federation: What is Taekwondo?